Growing up at the Jersey Shore I wanted to be the Beach Boys’ Surfer Girl. In the winter I was California Dreamin’ with the Mamas and the Pappas. I wanted to drive the Ventura Highway with America and wondered if I did know the way to San Jose with Dionne Warwick. As winter rapidly approaches here on the East coast I am not dreaming of a white Christmas. I’m dreaming of the sunshine and warm breezes of southern California and the valleys and bays of northern California. Thinking of how to use this inspiration for event design I turned to the Fairmont Hotels in locations from San Francisco to San Diego. Beautiful, elegant, classic – words our brides use to describe the feel of their wedding day – that’s how you feel at a Fairmont Hotel. Herewith photos from each Fairmont Hotel in California with my own inspiration key words and photos from ATB events to match……. Road worthy trolley transported the bridal party to the Monmouth County park where Kristin and Adam said their vows in a barn and partied under a tent. Photo courtesy of Tony Yang Photography. 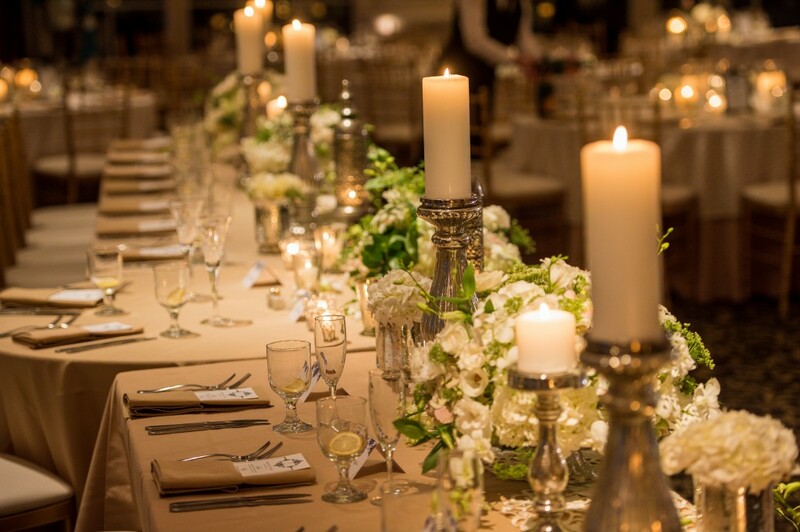 Kristiann and Nick's elegant head table featured letterpress menus, Mercury glass candle sticks of varying heights interspersed with lush floral arrangements on cake stands to give them just enough height. Photo courtesy of Jeff Tisman Photography. 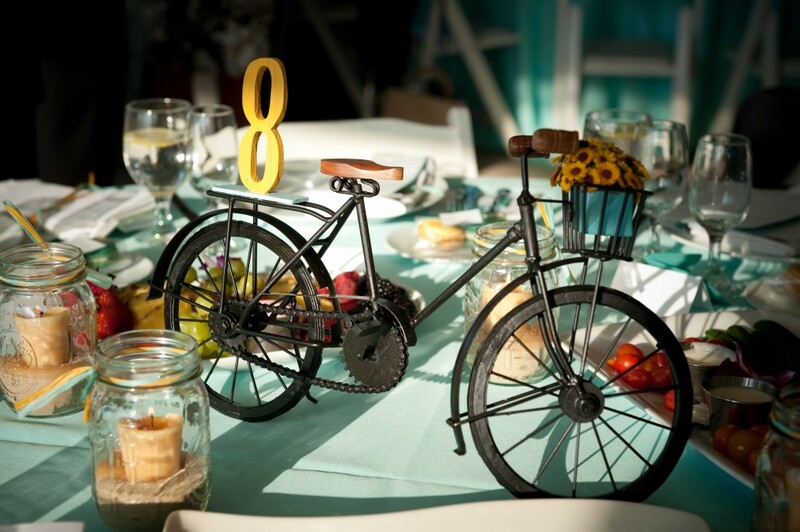 Heather wanted all sustainable, recyclable materials for her wedding to Tim at his parents' estate in Colts Neck. 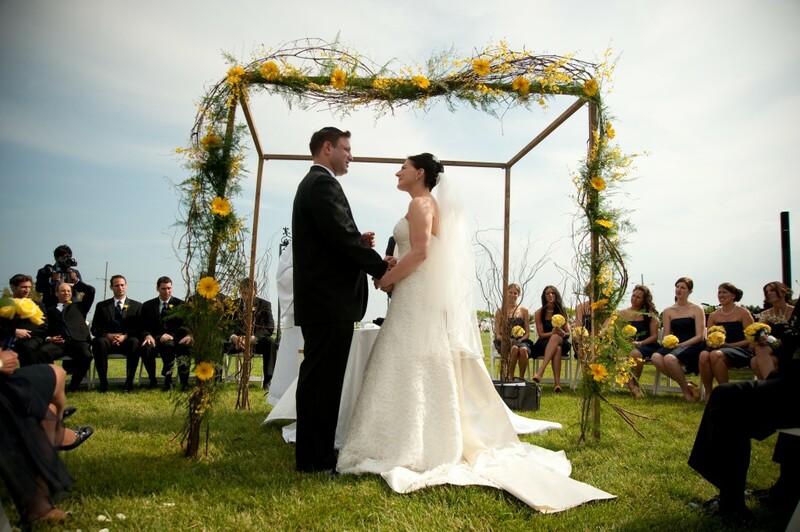 Their wedding arbor was made with trees and vines from the property. The sand was from their favorite NJ and CA beaches. Photo courtesy of ADC Photography. 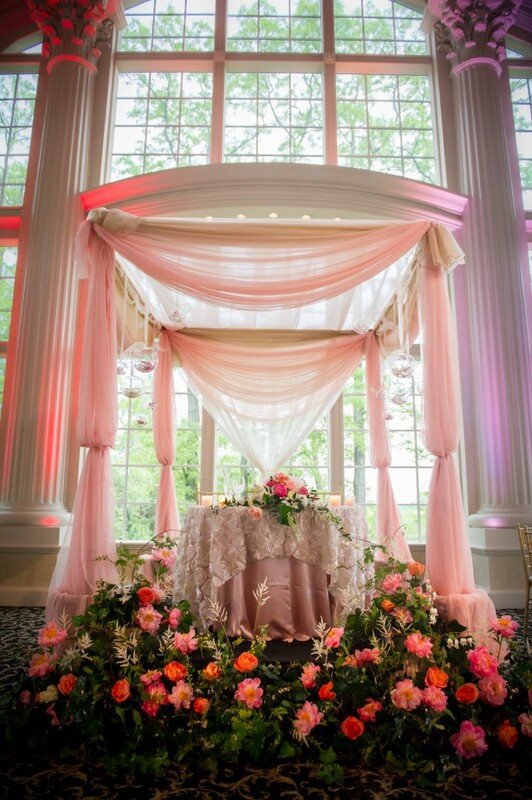 Floral designer used local organic roses and peonies to create the custom sweetheart table under a canopy of muslin on a raised platform. Photo courtesy of The Studio Photographers. 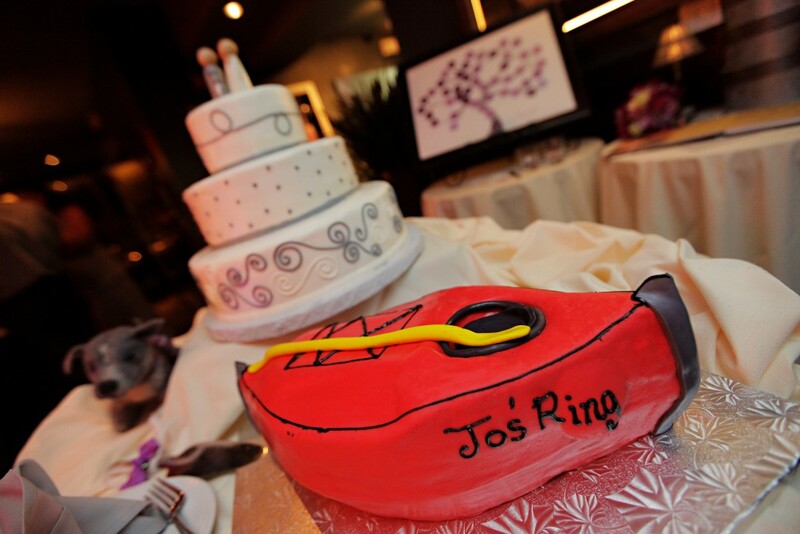 Julie and Mike were married at the historic Allaire State Park where the buildings date back to the 1800s. Photo courtesy of The Artist Group. 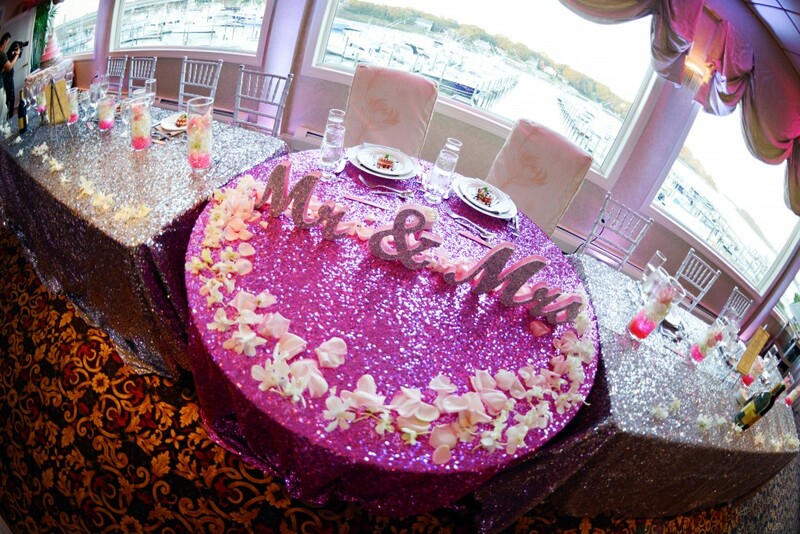 Brooke wanted sparkle and shine everywhere when she married Chris. 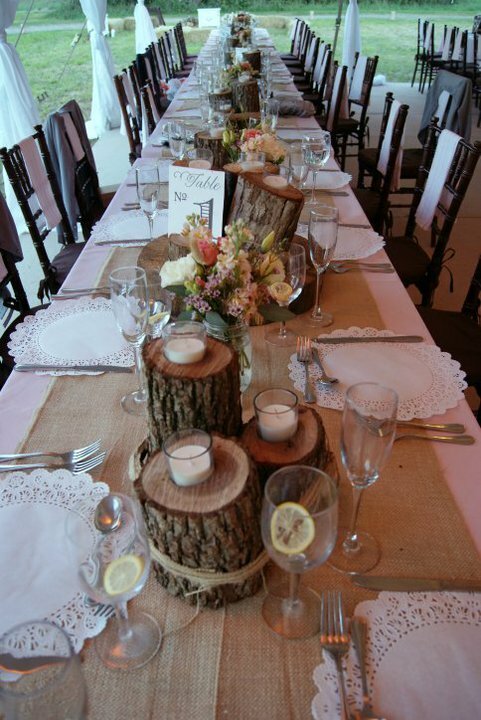 Sequined linens from CA linen company La Tavola helped set the mood. Photo courtesy of John Arcara Photography. 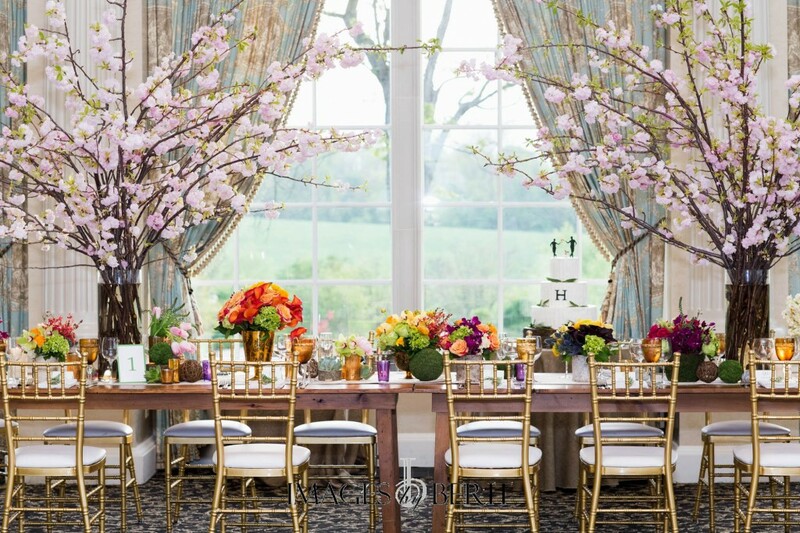 The event designer transformed the farm tables used for the head table into an outdoor garden that looks as if it is part of the landscape just beyond the windows. Photo courtesy of Images by Berit. 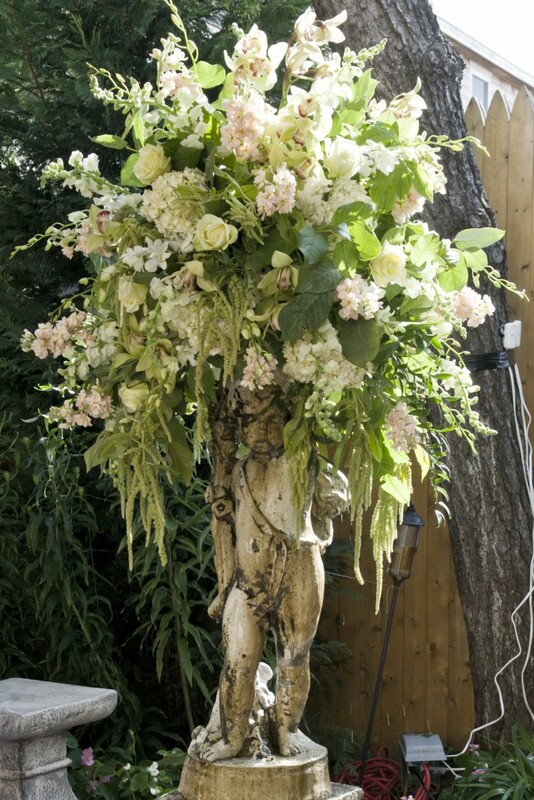 The fountain in the outdoor garden reception area was enhanced with a head full of flowers. Photo courtesy of clients. 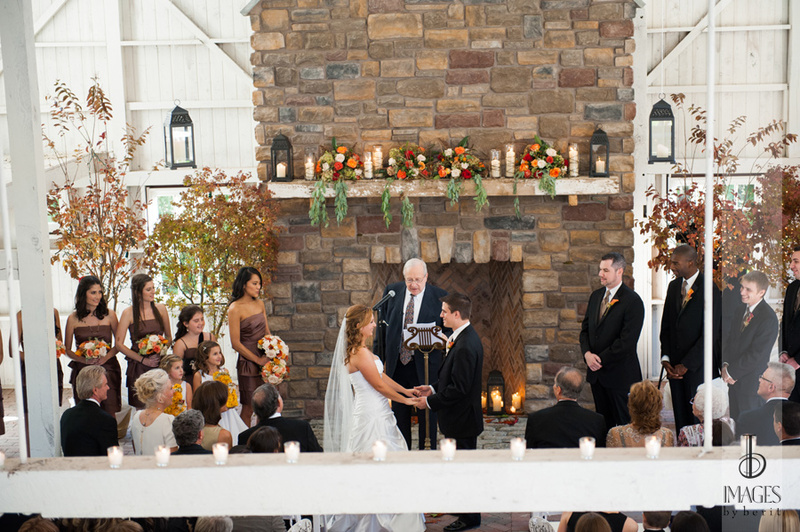 CA girl Morgan brought the outside in to the ceremony barn by using potted trees and fall colors to highlight her October wedding to NJ boy Craig. Photo courtesy of Images by Berit. Caitlyn and Patrick and their bridal party rode bicycles from their wedding on the beach to their boathouse reception venue on the bay. Photo courtesy of clients. It stopped raining long enough on Jen and Paulo's wedding day to fulfill their wish of getting married "feet in the sand" even if the sand was on the bay and not the ocean as originally planned. Photo courtesy of Jeff Tisman Photography. Do you play golf? Want an oceanfront resort with every amenity? 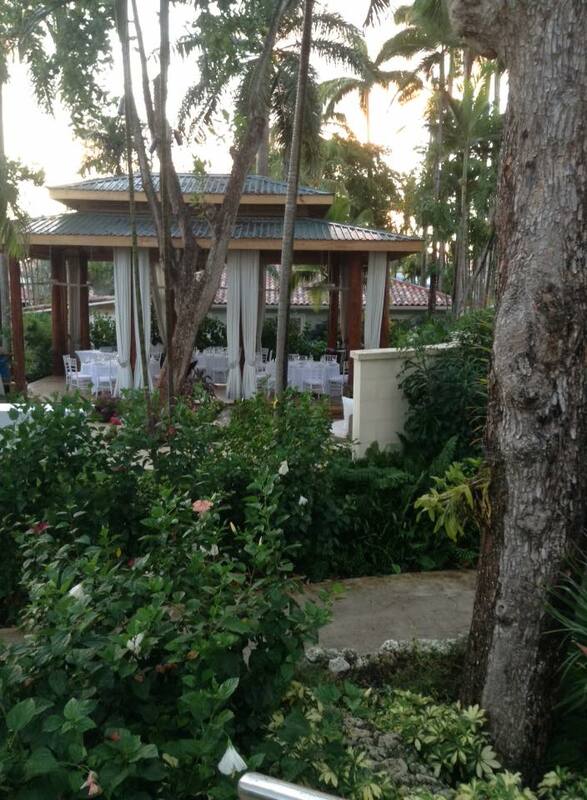 Then Sandals Emerald Bay is the resort for you! Located on Great Exuma in the Bahamas this resort was a Four Seasons before Sandals took it over, gave it a $20 million face lift, and opened it as Sandals Emerald Bay in January 2010 first as an all butler-suite resort and now as butler and club level rooms. 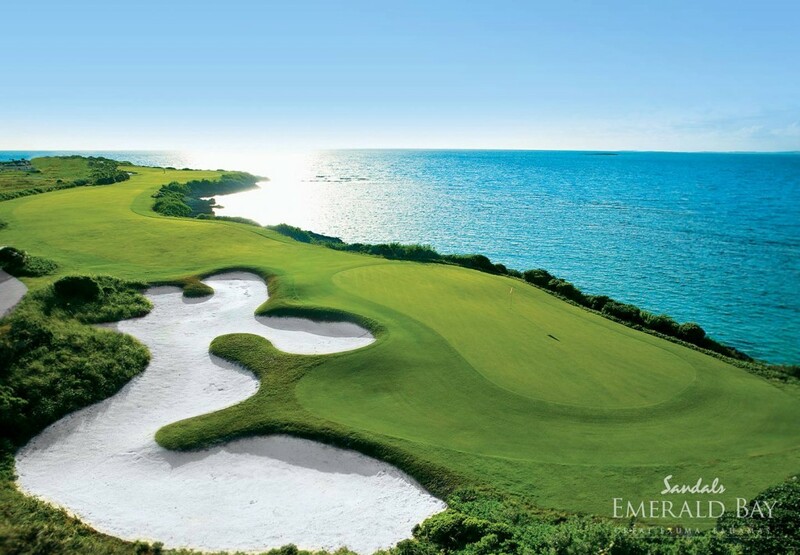 Unlimited rounds at the Greg Norman designed 18 hole par 72 golf course at Sandals Emerald Reef Golf Club are included for all Butler suite guests. Two rounds are included for club level guests. You may have seen the course on the Golf Channel's 2014 "Playing Lessons" or the 13th season of "Big Break." This resort is lush, luxurious, and well appointed. From the pool, to the beach, to the gardens. Relax and enjoy! Free Wi-Fi is available throughout the resort. What a place for a destination wedding! Choose from a variety of places for your ceremony, cocktail hour, and wedding reception. 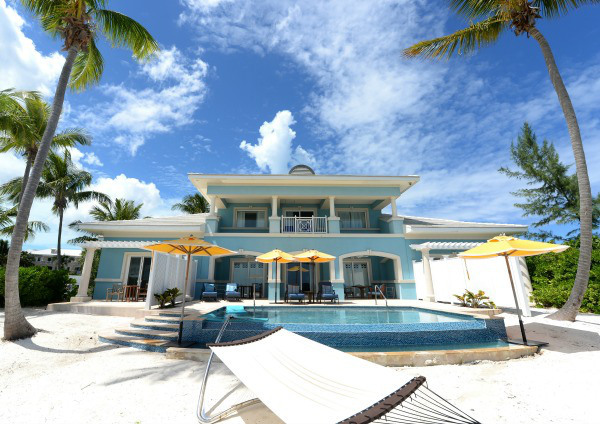 Host your guests for a welcome reception at the private pool at your Sandals Emerald Bay Royal Estate Love Nest. Photo by Dimitrios Kambouris/Getty Images for Sandals. 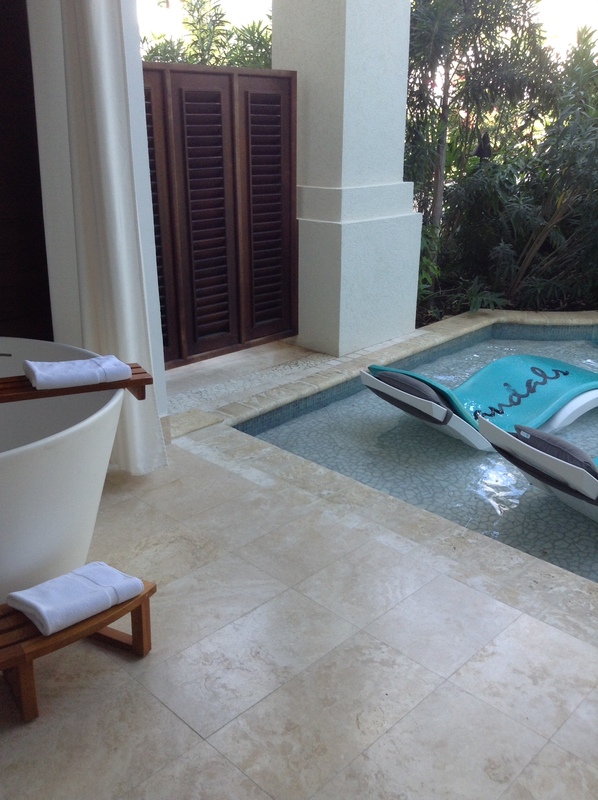 Sandals Emerald Bay Royal Estate Love Nest. All non-motorized water sports are included! SCUBA diving during the day, paddle boards, sailing, wind surfing, kayaks, aqua-trykes, and snorkeling. Picture yourself in a comfy lounge chair with an adult beverage on the silky white sand beach. Now CONTACT ME to book your reservation today! Sandals Barbados is the newest of the 21 Sandals, Beaches, and Grand Pineapple resorts scattered throughout the islands of the southeastern Caribbean's most beautiful beaches. 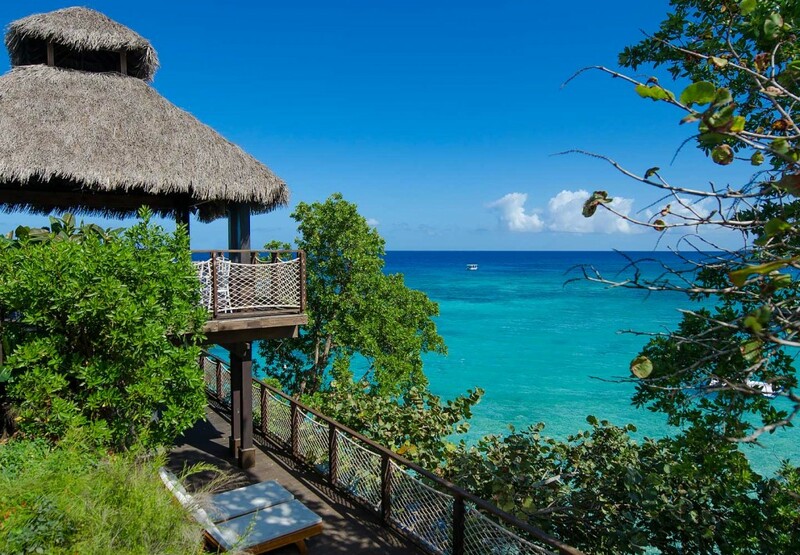 Opening in January 2015 this jewel located the St. Lawrence Gap area of Barbados has everything you would expect at a Sandals Luxury Included resort and more! 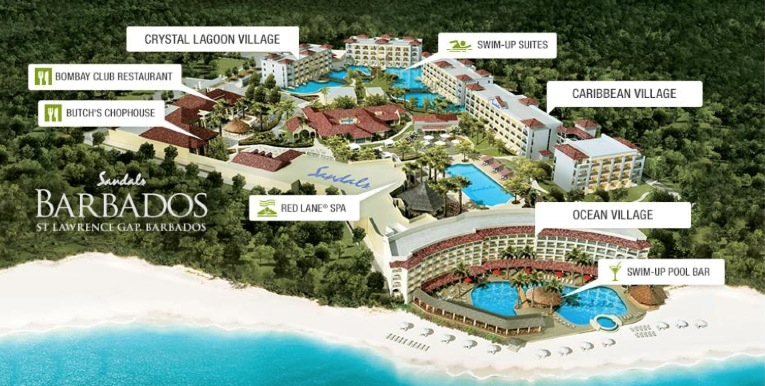 Site Map for Sandals Barbados. When you arrive at Grantley Adams International Airport (BGI) you'll go through Immigration and Customs. You will get the immigration form on the plane (bring a pen and look at it carefully BEFORE completion - I speak from experience). Once through immigration they will give you the departure stub - put that in your passport and bring it with you when you leave. Take your luggage outside the terminal to the Sandals Barbardos transportation area where you will be greeted warmly with cool towels and cold bottles of water (it took me 30 minutes from the time the plane landed until I got to the Sandals desk with carry on only luggage). Check in and your luggage will be tagged and put on a truck that follows the shuttle to the hotel. NOTE: Shuttles are provided by outside companies. The drivers and baggage handlers are not Sandals employees and should be tipped. The airport has FastTrack Service should you wish to take advantage of it. 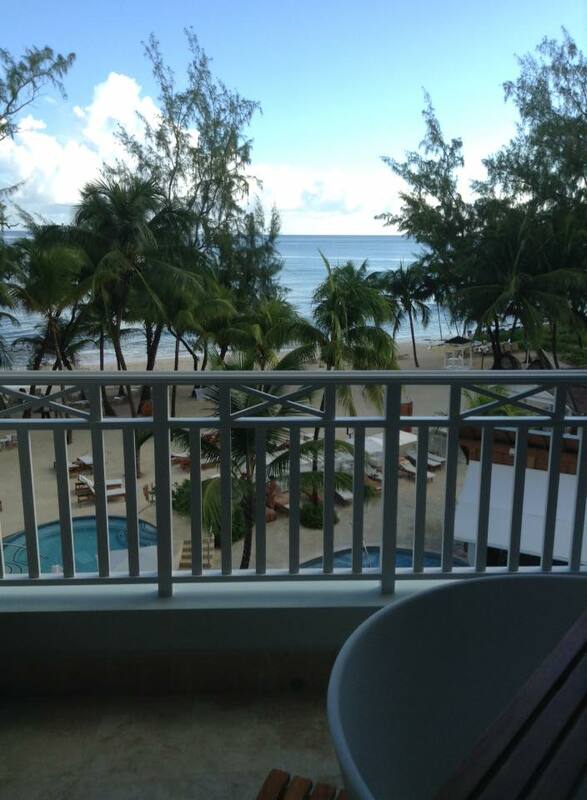 The view from my Club level room in the Ocean Village Royal Tower at Sandals Barbados. A 15 minute ride brings you to the resort. Once on property you'll be directed to the main check in desk or the Club Lounge for Club level and Butler service rooms. Regardless of room category you'll need a credit card on file for any incidentals such as photos, spa services, off-site excursions, or gift shop purchases. You will also need your return flight info. 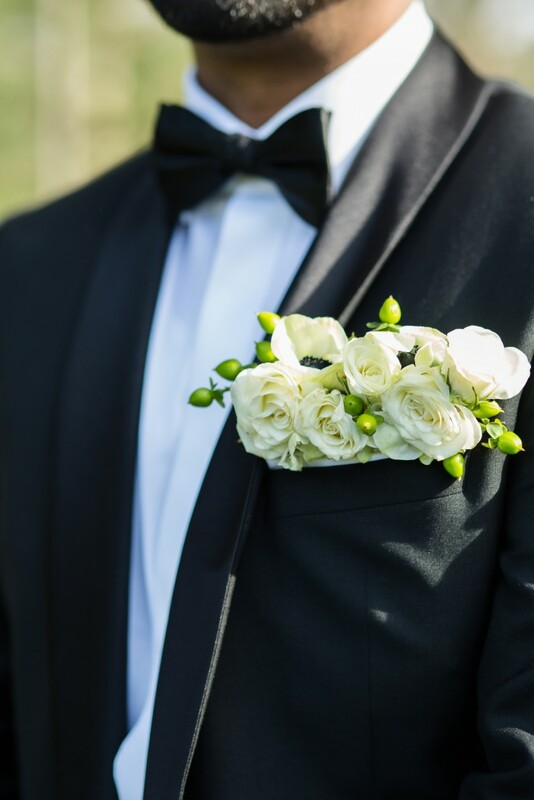 Tips for Butlers should be paid in cash before you check out. Please do not attempt to tip any other employee. If they accept they will be fired. Once checked in you'll be escorted to your room and given a brief tour of the grounds and the features of your room. Your bags will soon follow. Lounge area under the Royal Tower. To the right is a bar and then the Bayside Restaurant (buffet and griddle service open for breakfast, lunch, and dinner). Straight ahead is the main pool and then the beach. The dive desk is here as is the Culinary Desk and Island Routes. The resort is easy to navigate (see map above) with plenty of places to eat a meal or get a snack, order an adult beverage, have a cup of coffee, swim, or relax in a comfy chair . There are 12 dining options ranging from a hot dog cart for lunch by the main pool to the choice of Indian, Italian, Seafood, Sushi, Japanese, or Butch's Steakhouse for dinner. Some request reservations. Always check with the Culinary Desk (or your Butler). There's plenty of casual dining too. You won't starve I promise! Club rooms come with room service from 8:00am -10:00pm daily. Butler suites have 24 hour room service. View of the kitchen for Dino's (freshly made pizza) and Mariner's restaurants. Umbrella tables are off to the right. You can also see the Sandals Barbados water sports desk where catamarans, kayaks, windsurfing, paddle boards are ALL INCLUDED! There is waitress service on the beach too. You can do as much or as little as you like. There is a volleyball game in the main pool each afternoon. You can take a yoga class, go to the spa, relax on the beach, or do an off-site excursion through Island Routes. 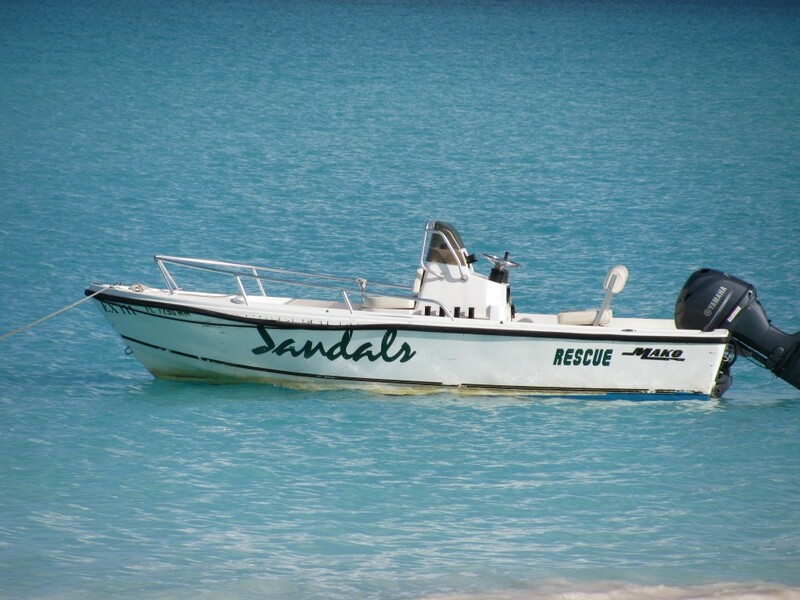 Your stay at Sandals Barbados includes non-motorized water sports, SCUBA diving (certification available at additional cost), and snorkeling (2 off-site trips on Fridays - morning & afternoon. Spaces fill quickly so sign up the day you arrive). Actually saw the Sandals Barbados dive boat when my husband and I were in Barbados snorkeling during a cruise stop to the island. The boat stood out as being brand new and state of the art compared to the others at the same location. The yoga pavilion has ceiling fans and can be used for wedding ceremonies or group meals. This is how they set it up for us for our welcome group dinner. There was a full bar set up off to the left. You can see the corner of a couch on the right that was next to a firepit and had an in ground tub filled with ice, champagne, and water. Destination wedding? 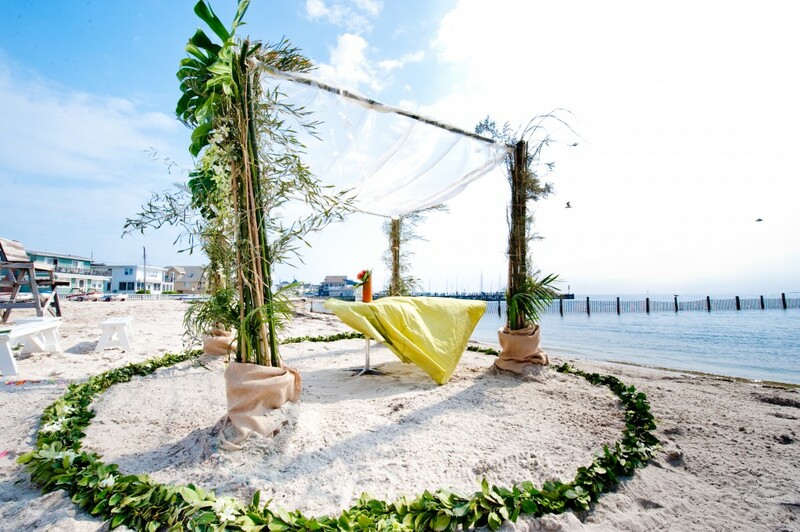 Get married with your feet in the silky white sand or on an open air patio. Choose from 6 cake flavors including 3 new ones and 10 signature drinks. Decisions, decisions! 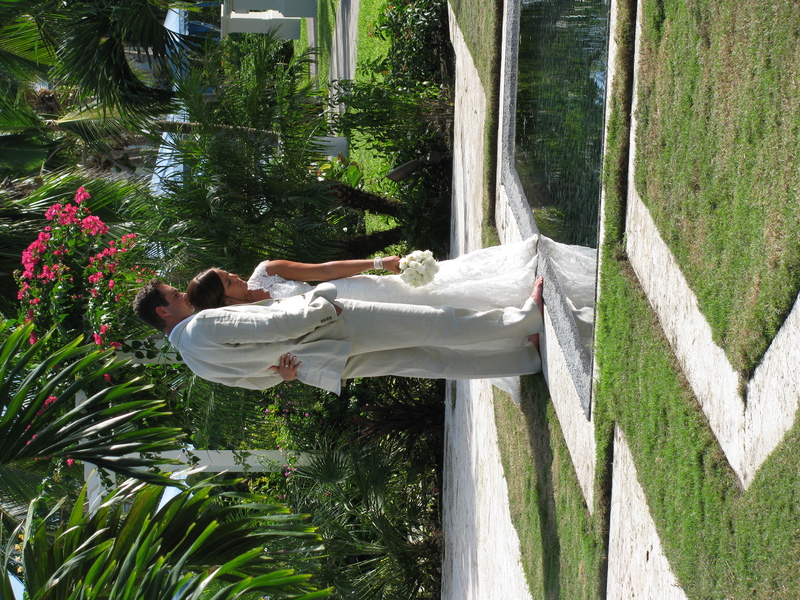 Sandals WeddingMoons makes it easy to plan the destination wedding of your dreams! ASK ME for details! 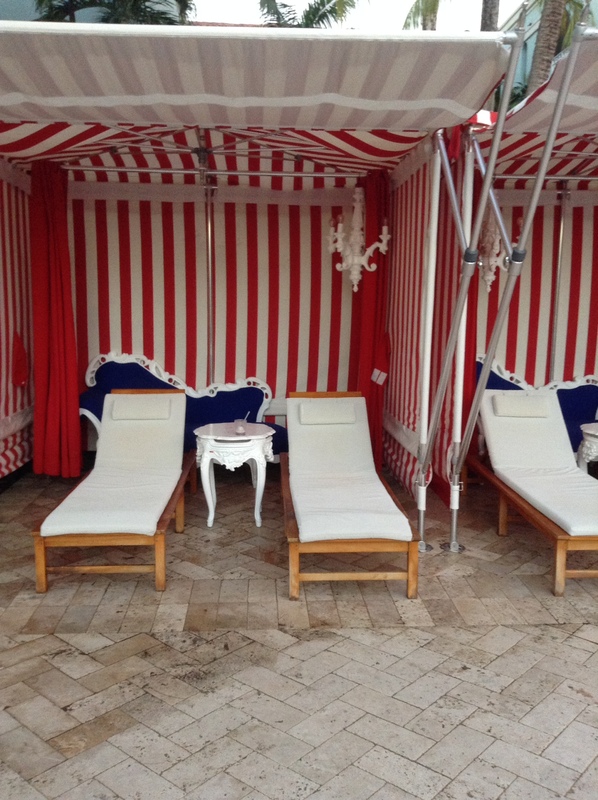 These cabanas at the pool near the Caribbean Village at Sandals Barbados are on a first come, first served basis. The Portofino Restaurant and Cafe de Paris are nearby. Waitress service is also available. In brief, I loved it here and would go back again in a heartbeat. 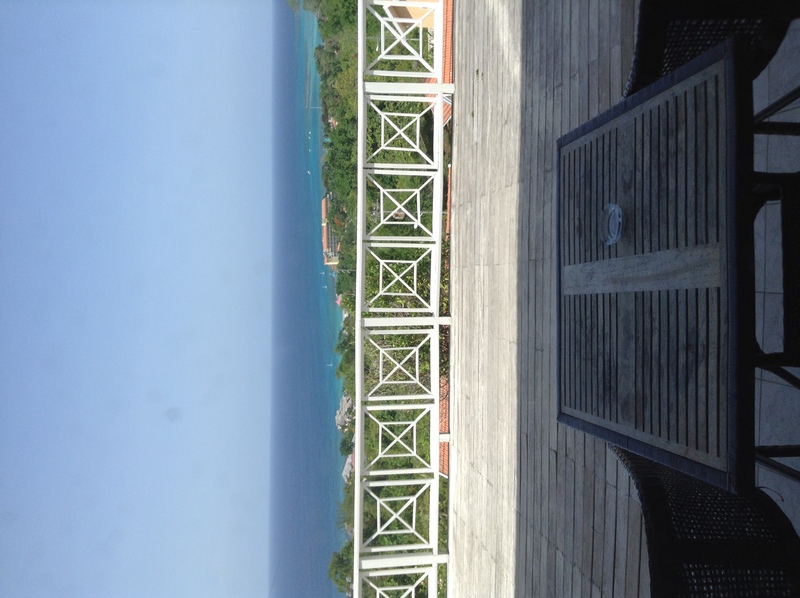 Barbados is a fabulous island with lots of shopping and nightlife. Stay at the resort or venture out - it's up to you! There is already an addition under construction that will be ready mid-late 2016 with additional guest rooms, a new pool, and another restaurant. Construction of two beach jetties to help calm the ocean in front of the resort should be done by the time you read this. Butler suites are located in each building. This one is on the end of an upper floor in the Royal Tower. 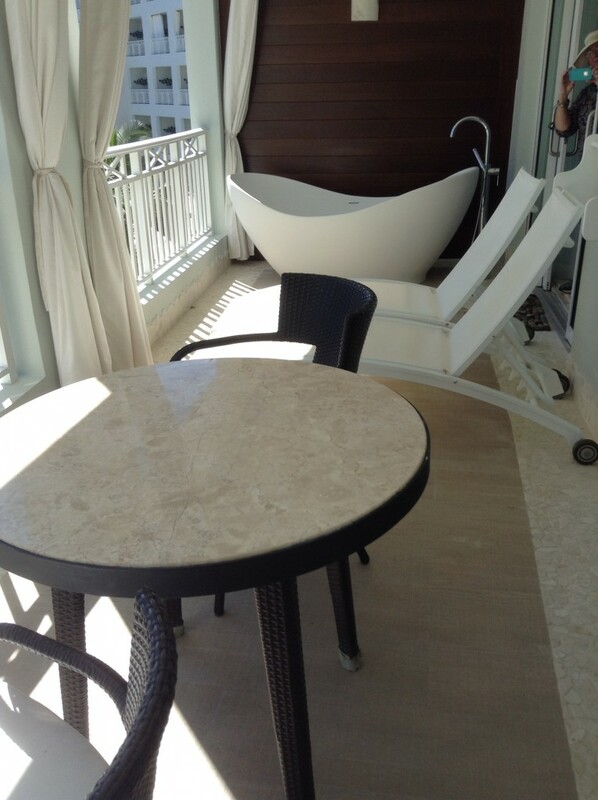 After a long day in the sun have your butler bring champagne and strawberries to sip and share as you relax in the tranquility tub. Want more photos? Follow us on INSTAGRAM @ATBWeddings! Want more info on how to book your honeymoon, vacation, or destination wedding at Sandals Barbados or any Sandals, Beaches or Grand Pineapple Resort? Contact me and I will hook you up! 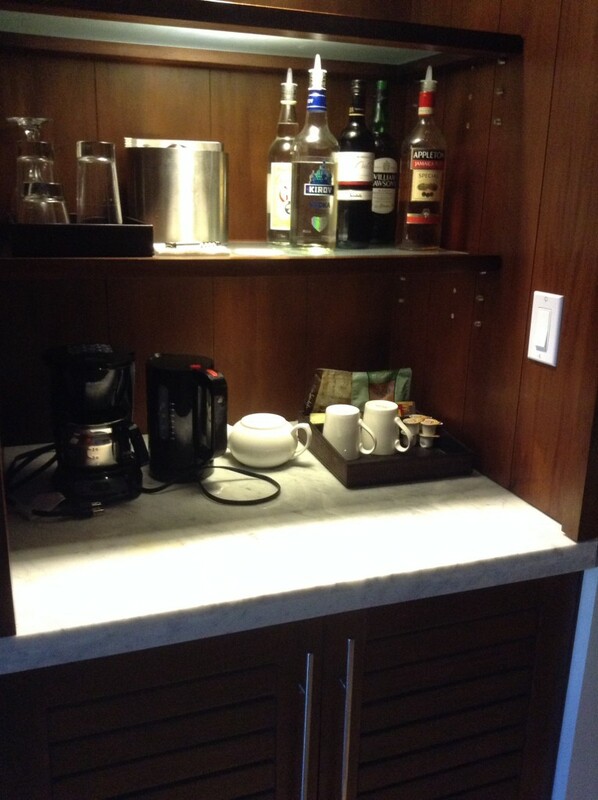 Beverage station and mini fridge in any Sandals Butler suite can be customized for you. Let us know your choices before you arrive and they'll be waiting for you! 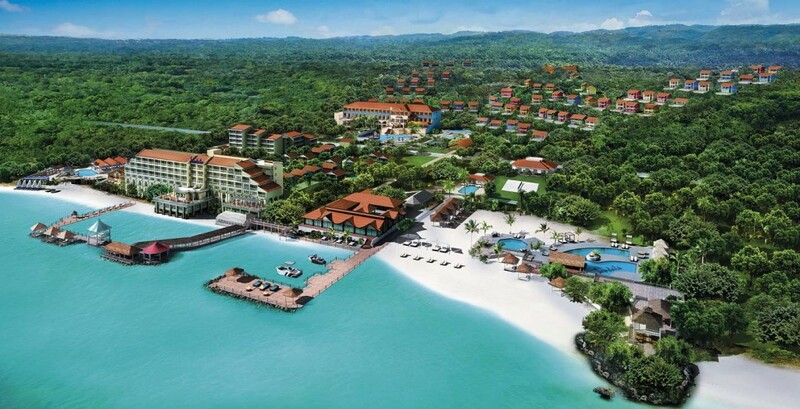 Sandals Ochi Beach Resort was formerly known as Sandals Grande Rivera. By any name it is a sprawling property that has two sides - Seaside and Hillside - and a total of 15 restaurants that are available to all guests. There is constant shuttle transportation available between the two. If you're in a suite in the Hillside Butler Village you have literally 24 hour access to a butler driven golf cart. 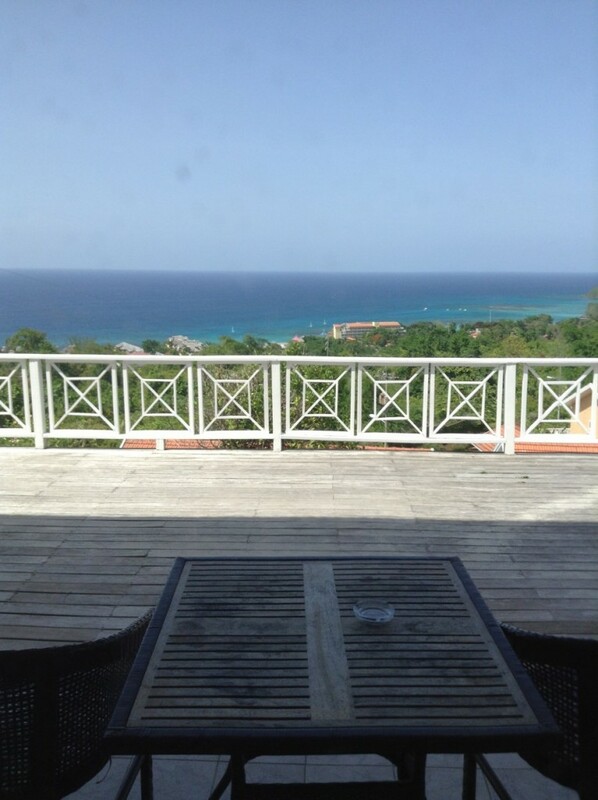 View from one of the villas in the Hillside Butler Village at Sandals Ochi Beach Resort. This particular Villa had 4 suites which shared this patio and a small pool with lounge chairs. Our tour started on the Hillside. The views from the top are spectacular. There are private and semi-private villas, some with their own pools. There's a rock climbing wall, shuffle board court, and dozens of places to host a wedding ceremony and reception including a permanent tent that can hold up to 350 guests. There's also a huge swimming pool. 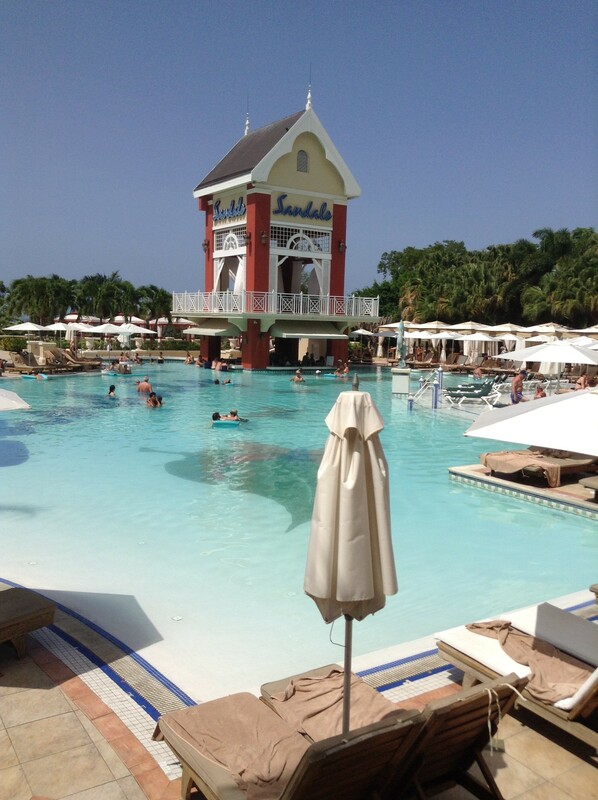 This is the main pool with swim up bar for the Hillside guests at Sandals Ochi Beach Resort. Go back down the hill and across the street and you'll be in the Seaside Village. 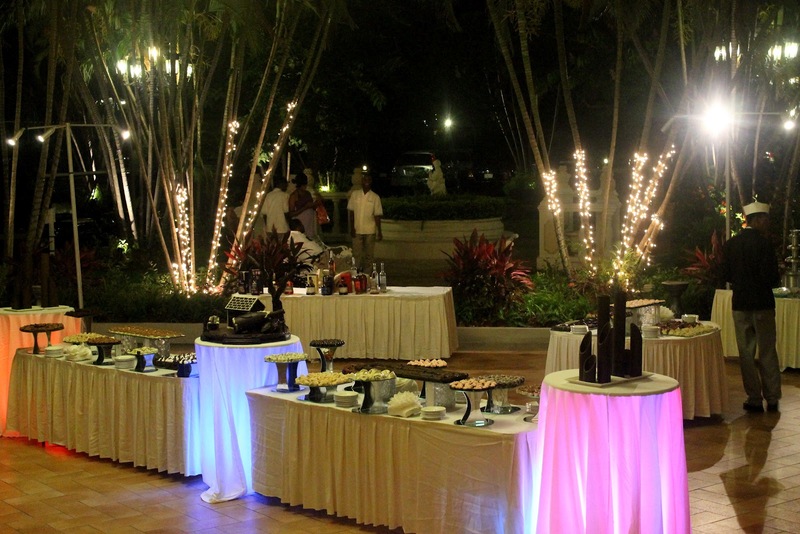 A weekly white party and chocolate buffet is located at the Manor House. We saw a man and a woman walking around among the guests covered in chocolate. There were chocolate cakes, chocolate cocktails, chocolate candies, and chocolate covered fruit. More ways to serve and eat chocolate then I have ever seen! Chocolate Buffet set up at the Seaside Manor House. So much chocolate including cocktails! 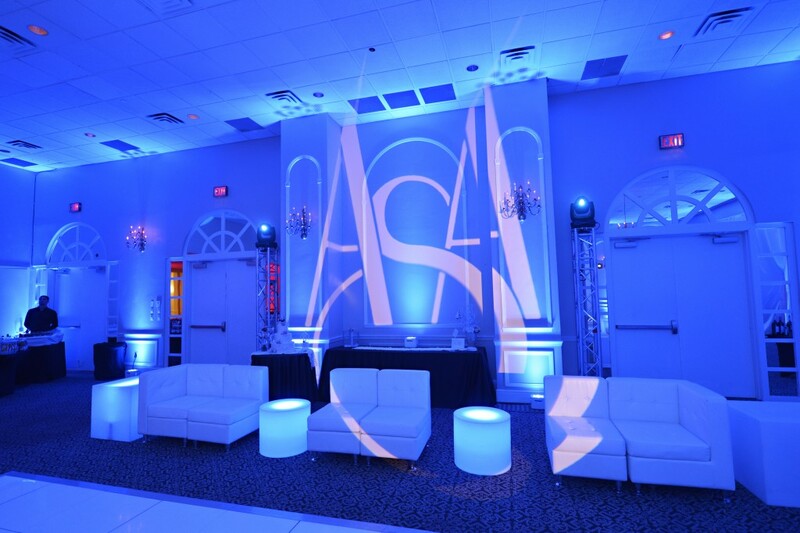 This coincides with the weekly White Party at Sandals Ochi Beach Resort. 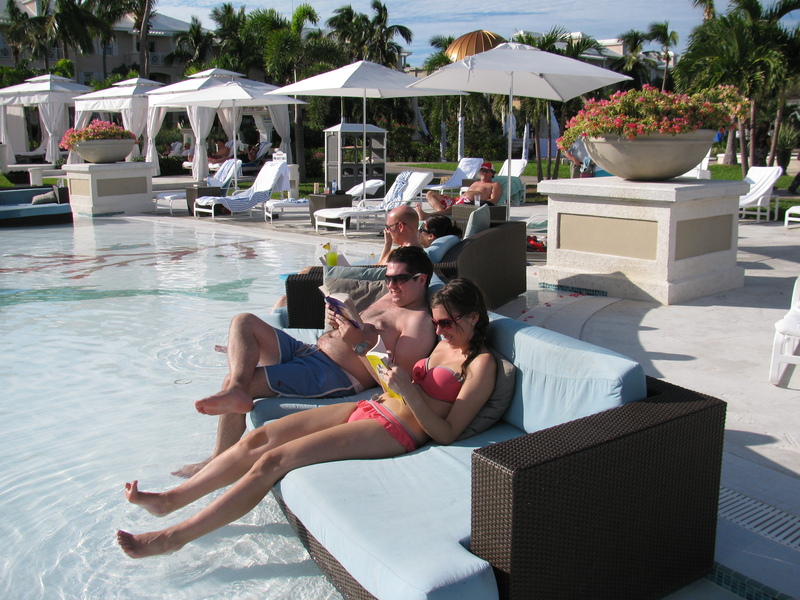 Sandals Resorts has a Loyalty Recognition Program. We met a woman who was proudly wearing her gold sandals pendant for achieving (way beyond) the Platinum Level. Everyone knew her by name and asked about her husband (who had already gone to bed). When asked why they kept coming to Sandals she said "My husband and I have been to many other hotels and resorts around the world. We keep coming back to Sandals because we love it. We are treated like this no where else. Who wouldn't want to keep coming back?" 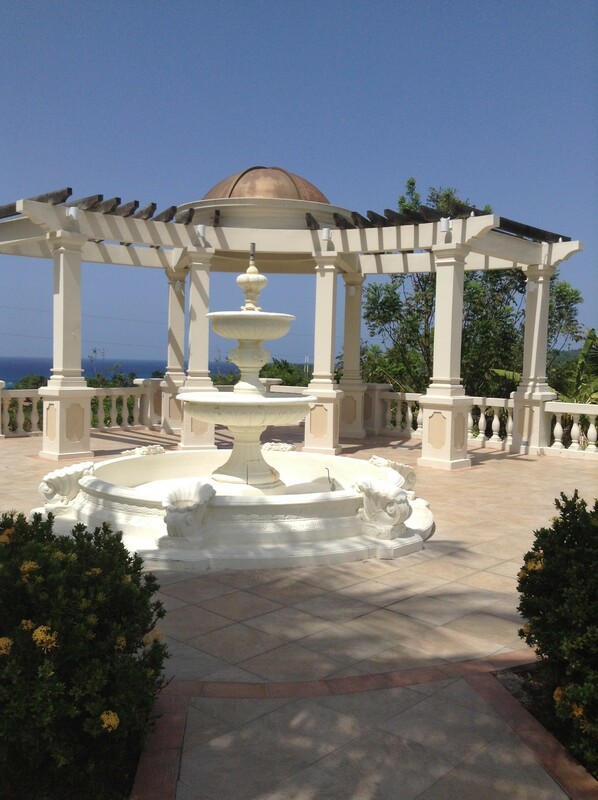 Portico, patio and fountain located in the Hillside Village at Sandals Ochi Beach Resort. Great location for a wedding ceremony, cocktail hour, or small reception. 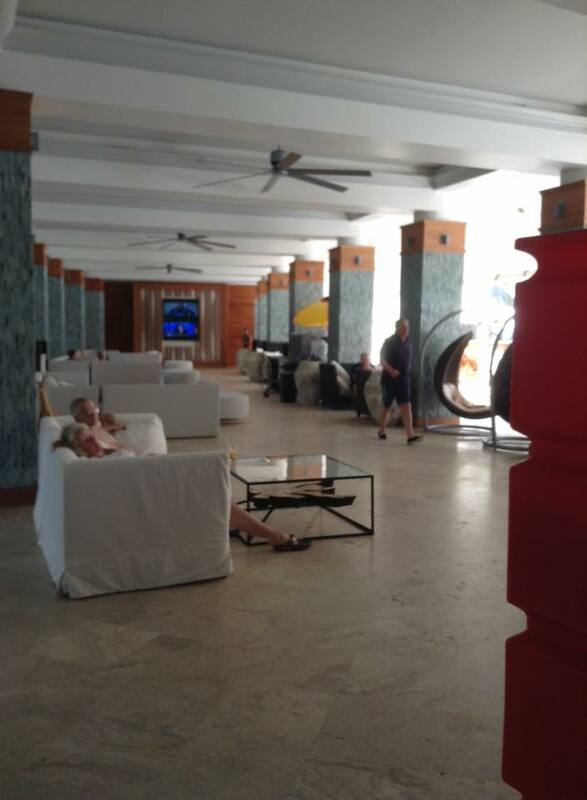 The Ochi Beach club is accessible to guests from both Sandals Ochi Beach Resort and Sandals Royal Plantation. The gazebo at the end of a boardwalk features a hand carved ancient door (said to be good for fertility) and views of the ocean from a hidden hammock or lounge chair. There's a pool, bar, fire pit patio, volleyball court, and food service. 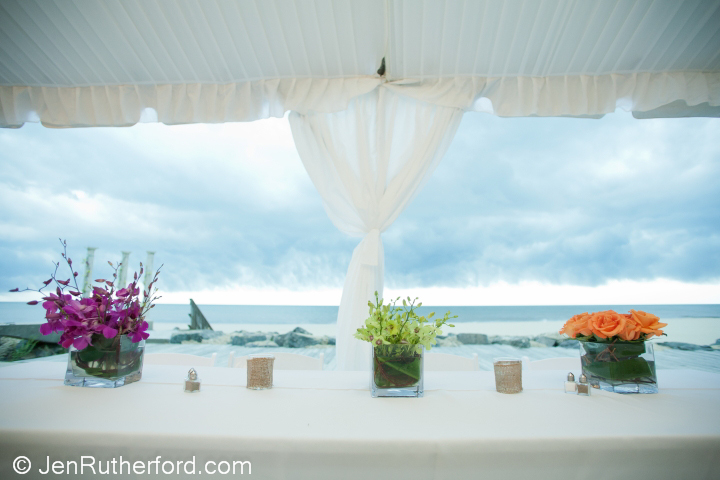 You can have a set up for a wedding reception or corporate dinner on the long pier. 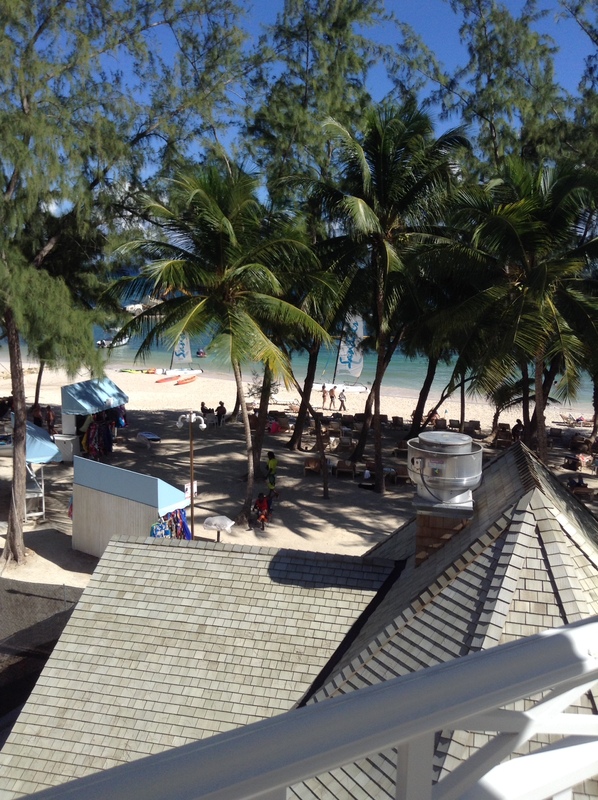 You can choose to be alone or hang with the crowd at the Ochi Beach Club which is part of Sandals Ochi Beach Resort. This is a lively resort though it can also be private and secluded in the Hillside Butler Village. Lots of room categories to choose from. This is the resort for those who want to choose between doing a lot, doing a little, or doing nothing. You won't be sorry no matter what you choose. Map of Sandals Ochi Beach Resort - you can see the street that separates the Seaside from the Hillside off to the left. Shuttles run constantly between the Beach Club (far right) and the Hillside accommodations. Butlers have their own golf carts to shuttle their guests around the property. Don't you think there are a billion options for wedding bouquets? Large, small, loose, tight, round, cascade, and on and on. 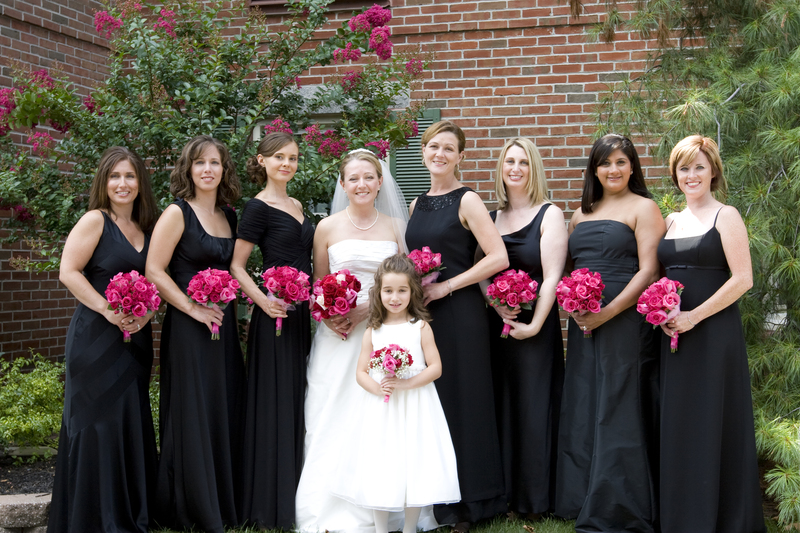 How does a bride choose for herself and her attendants? Some of our past clients had sentimental reasons for choosing a specific flower for their bouquets. Others went for a color or what was in season. Visit our Pintrest page for more options. Brooke's color palette was pink ombre with lots of sparkle. 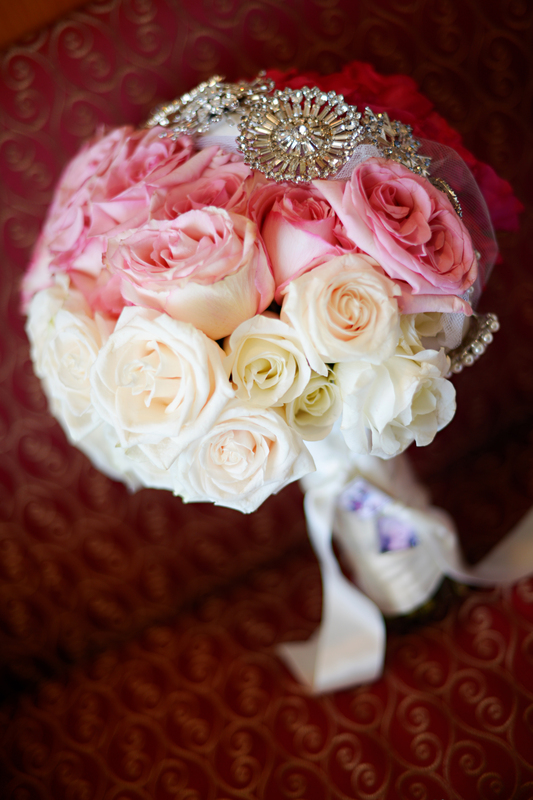 Her bouquet featured hand tied roses and family brooches. 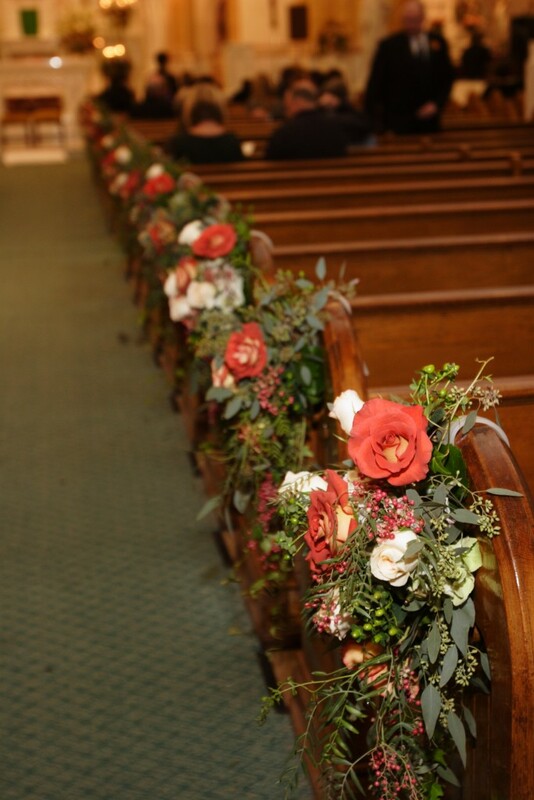 She tied photos of late family members including her father to the bouquet. Caution; this bouquet was heavy! Photo courtesy of John Arcara Photography. 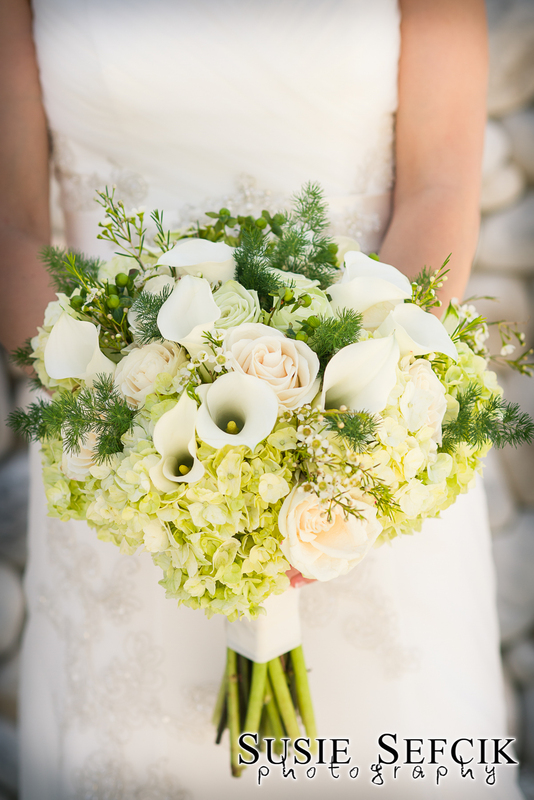 Kim's bouquet was 90% stephanotis and 10% white and green dendrobium orchids. 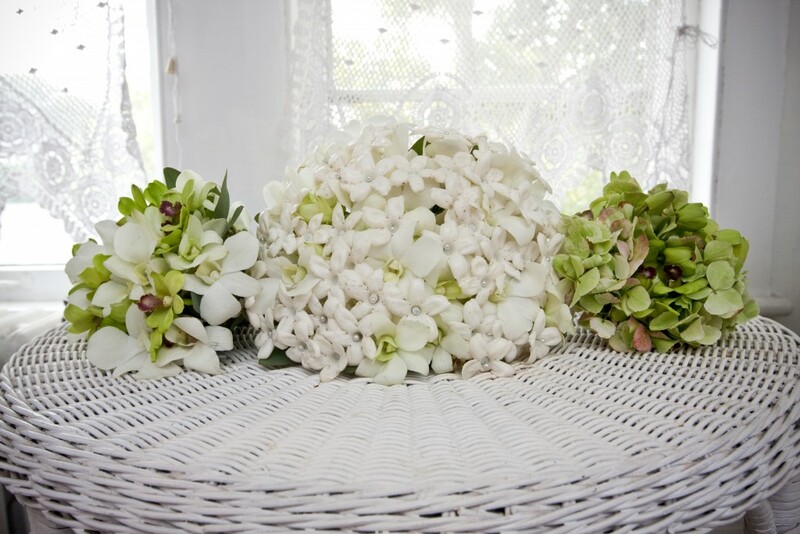 Her MoH carried a small bouquet of white and green dendrobium orchids. The green hydrangea was a pomander for the flower girl. Photo courtesy of The Artist Group. 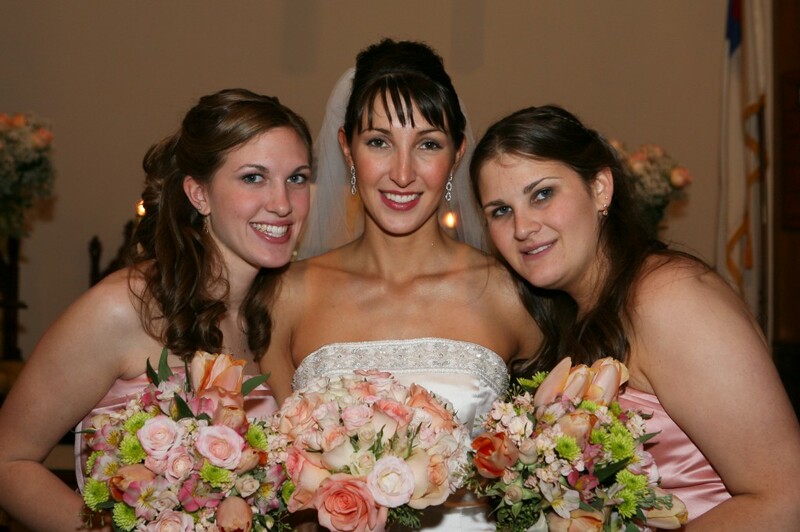 Lacey gave her florist a piece of wallpaper as the inspiration for her bouquet and her sisters. Photo courtesy of J&R Guarino. 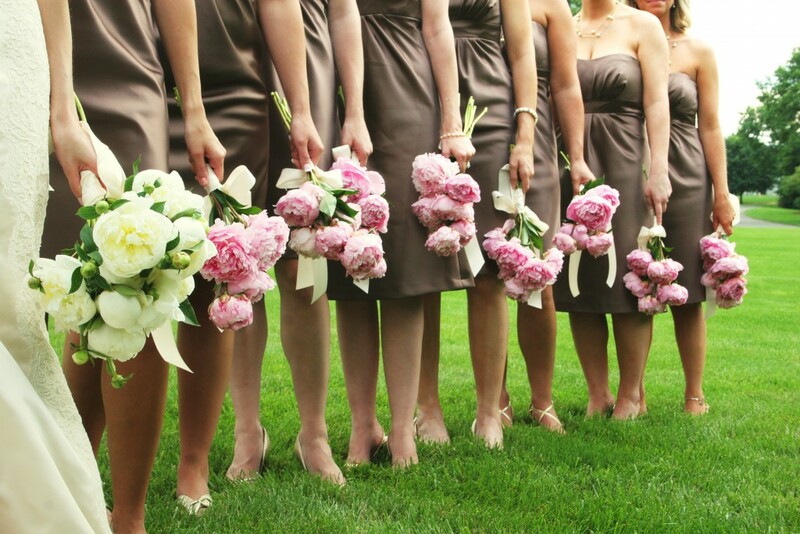 Heather kept it simple for the bouquets - peonies. White for her, pink for the girls. Photo courtesy of ADC Photography. 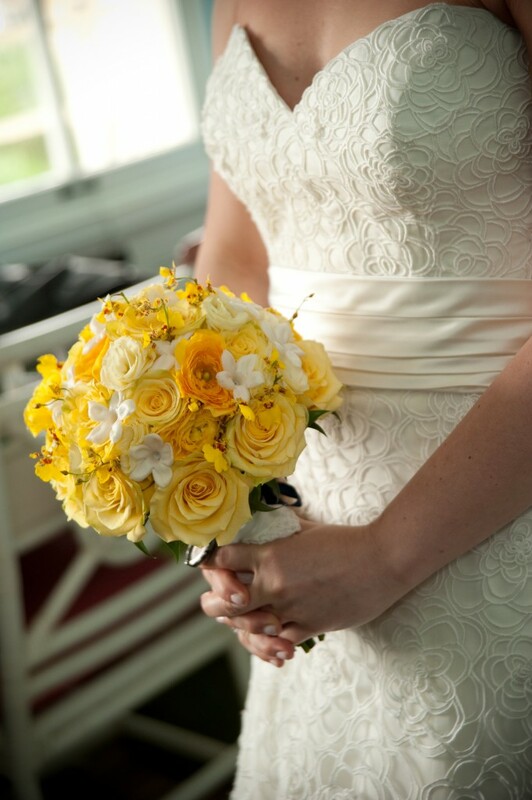 Marissa's yellow bouquet featured rananculus, roses, tiny yellow Oncidium Orchids, and stephanoitis. Photo courtesy of John Decker Photography. 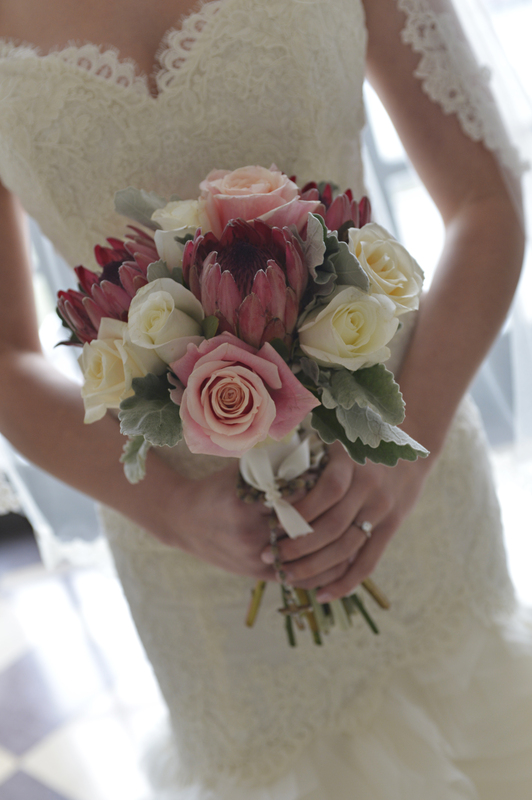 So much variety & texture in Jen's bouquet! 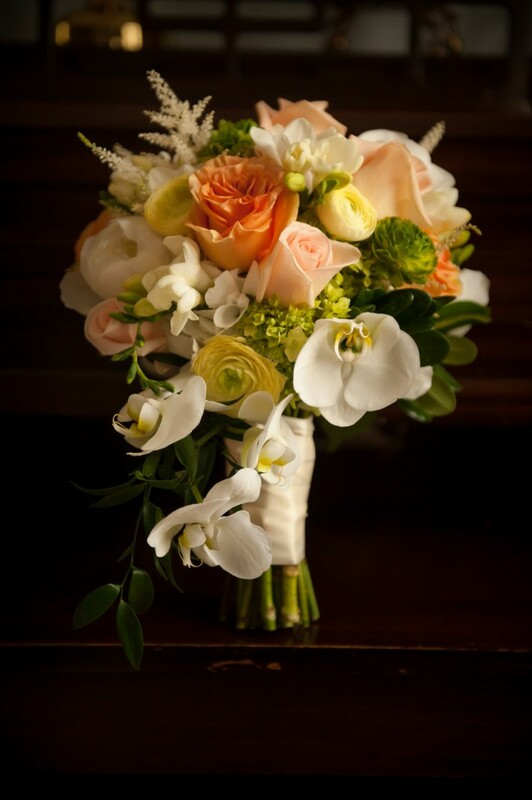 Astilbe, 3 different colors of roses, phaleanopsis orchids, hydrangea, peonies, ranunculus, and white firefox. Photo courtesy of The Studio Photographers. 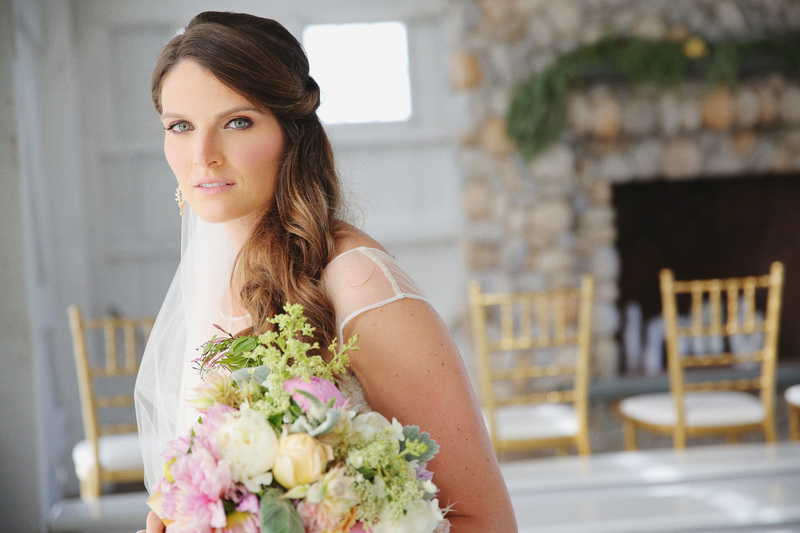 Jordana had to re-schedule her early November wedding to July of the following year after Superstorm Sandy. She chose a white palette for her bridal bouquet including roses, ferns, chamomile, hypericum berries, mini calla lilies and hydrangea. Photo courtesy of Susie Sefcik Photography.